To distribute and switch the latest in 4K/2K HDMI video signals, the HDR 4x2-Pro allows users to switch four HDMI inputs with two high-definition displays. 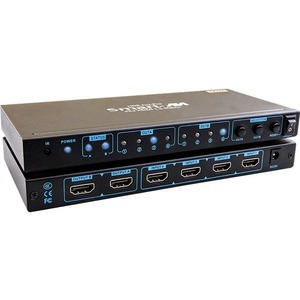 Two outputs give users flexibility while routing HD audio and video signals with two displays. The HDR 4x2-Pro eliminates the need to disconnect and reconnect HDMI sources to a single display. The device is compatible with computer sources, live HD television feeds, Blu-ray players, gaming consoles, video cameras and more. Controlling the matrix switch is simple thanks to the front tactile buttons and the included infrared remote control.